The second instalment of our 2018 Winter Dining series (check out last year's looks if you haven't already) is this elegant, moody winter dining space, perfect for cool-weather entertaining. This rich, layered space may look like a lot of effort to achieve but read on and we'll let you in on our stylist's secrets for creating this look with simple pieces (shop them all here!) and just a little know-how. 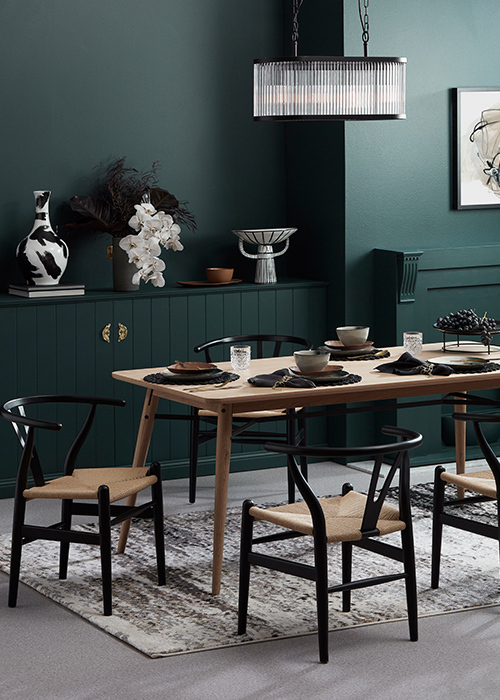 Let's not avoid the (beautiful) elephant in the room – those rich forest green walls make this dining space sing! 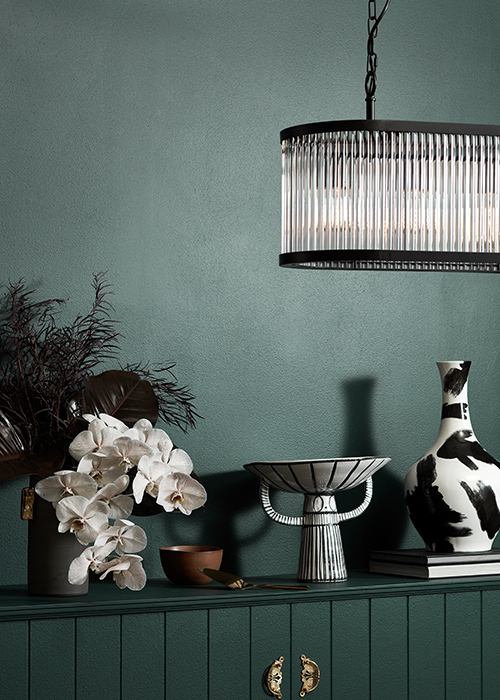 While bold shades like this might leave you feeling a little apprehensive, they are perfect for achieving impact on a budget – even a single wall, a rug or even decor in a bold shade will have a similar effect. 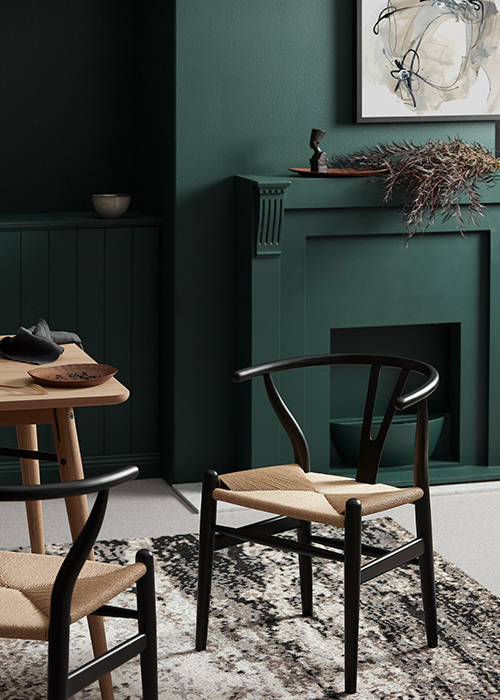 Classic replica wishbone chairs and a simple oak dining table with black, brushed-metal detail contrast with the bold wall, while a statement pendant adds interest and depth. A rug and striking decor on the sideboard, all in simple monochrome, complete the look. 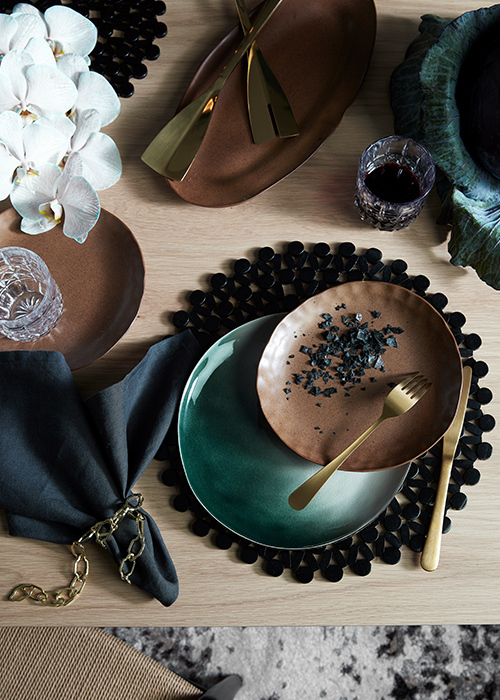 Texture, layers and a pared-back colour palette form the basis of this striking table setting. A sculptural placemat paired with faceted crystal glassware and linen napkins add depth – our stylist's trick, pick up some gold chain from your local hardware store to tie around each napkin for a magazine-worthy look. Brushed gold cutlery, stone side plates and stunning ombre dinner plates in organic shapes complete the look, and sticking with a simple colour palette keeps the tabletop from feeling overdone. -Go bold or go home! Whether its on your walls or in a piece of decor like a rug or artwork, try a bold colour for the ultimate in winter dinner party elegance. -Keep furniture choices simple. The classic oak table and wishbone chairs show that even with basic furniture pieces, you can create a showstopping look. -Layer, layer, layer! From the tabletop to the sideboard and decor, this space is full of rich layers. Stick to a simple colour palette throughout for success. Shop this stunning space now and keep your eyes peeled for more styling ideas, cool-weather collections and inspiration in our Stay in, Be cosy edit.